Who lives in a pineapple and released a new holiday CD? SpongeBob SquarePants! 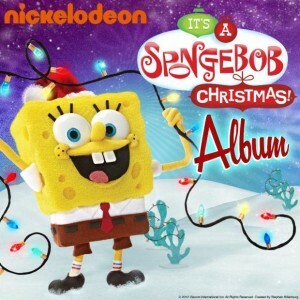 It’s a SpongeBob Christmas! Album is the companion to the brand-new stop-motion holiday TV special. Co-written by legendary songwriter Andy Paley, whose past credits include collaborating with The Beach Boys, Jerry Lee Lewis, Ramones and Madonna, this album marks the second time he has visited Bikini Bottom, the first being the 2006 cast album The Best Day Ever. Paley and SpongeBob voice actor Tom Kenny wrote the holiday songs which were the premise of the TV Special. In particular, the song “Don’t Be A Jerk (It’s Christmas)” is the best of the bunch. It’s point-blank effective and simple enough for children and adults. It’s also one which I’ve listened to at least 100 times! I absolutely adore it! I can’t get enough! We were honored to get an exclusive interview recently with SpongeBob voice actor Tom Kenny, who was the Guest of Honor at the Memphis Comic and Fantasy Convention. He was eager to discuss making this album and performing live SpongeBob concerts. You can read the full interview here. It’s A SpongeBob Christmas! Album offers 12 original tracks, four of which are included in the TV special. A few of the songs include the entire cast reprising their respective characters and interact with each other. I enjoyed those very much. But if I had one wish for this CD, it would be to include more of the cast in a few more songs (instead of having so many SpongeBob solos). I don’t know whether to describe this as either an adults’ album for children or a children’s album for adults… either way, it’s great and I really enjoyed it. I recommend it for children of all ages, but I hope this isn’t the last Paley-Kenny musical collaboration. Maybe one day, they can co-write a full-length SpongeBob musical episode! That would be great! Nothing but songs by SpongeBob and friends! This CD can be purchased through iTunes or Amazon. It’s a terrific seasonal album that will surely become a winter-time tradition for children and adults of all ages.